This bioactive tetrapeptide corresponding to the N-terminus of Thymosin ��? is a physiological regulator of hematopoiesis and inhibits the entry into the S-phase of murine and human hematopoietic stem cells. Ac-SDKP has been shown to reduce the damage to specific compartments in the bone marrow resulting from treatment with chemotherapeutic agents ionizing radiations hyperthermy or phototherapy. 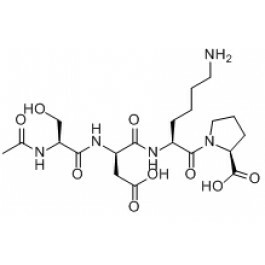 It protects from doxorubicin-induced toxicity. Ac-SDKP is a physiological substrate of angiotensin I- converting enzyme (ACE).